Time flies… didn’t realize that October is coming and now we are getting ready for year end. So any plans and ideas how you want to end your 2016? Holiday season is a special time full of energy and passion when even a negative mind can be shifted to positive one. THREE Holiday Collection for 2016, themed Wild at Heart focused on celebrating a year full of sparkling stardust. Your heart brims with confidence, strength, and beauty. Sprinkle brilliant stardust at the end of the busy year, seemingly blessing your satisfied heart and countenance. This is a special 2016 holiday color and package, available in limited quantities. Sprinkle stardust and enjoy the holiday season. 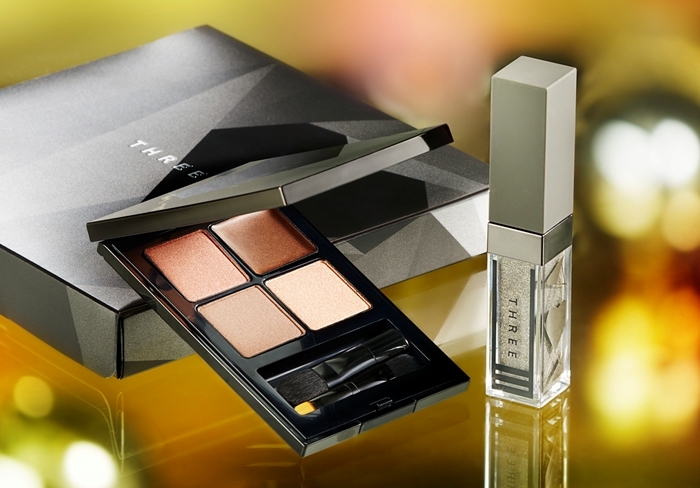 This limited edition kit consists of an eye color palette and an eye gloss stick. Create sophisticated depth with four eye colors and layer eye gloss on top with a luxurious dazzle for chic and gorgeous eyes. The luminance is just like the night sky, full of happiness and lots of dazzling stardust during the holiday season. Celebrate the happiest time of the year with eyes that exude special brilliance. 4D Plus Eye Palette X02 We Are All Made of Stars: the color used by the model, chic and precious copper-brown-based eye color palette reflects your hidden passion with an elegant and mature dazzle. Wisper Gloss for Eye X01 Star Child: this is the special small size for kit & color used by the model. The eye gloss contains cool and edgy brilliance of stardust scattered about with sheer clarity. Produces attractive eyes with a quality sheen complimented by a playful feeling. It is available in two new colors, frames eyes that shine like shooting stars. New colors with an enhanced yet delicate sheen are now available for eyeliners, allowing you to obtain the desired finish while freely controlling the feelings your eyes convey and the impression they make. Each eyeliner contains multiple types of pearls that express a sense of brilliance from the eyes, along with a profound and nuanced touch. 11 Star Star Star: the misty beige is cool and sensual. Add a gorgeous touch to the expression of your eyes with condensed delicate pale skin-colored pearls. 12 Stars Align: the color used by the model, grayish purple is chic and mysterious. Add bright pearl to the smoky hue. It is available in limited quantities, in two new colours. Tint your cheeks with a happy holiday feeling. The whipped gel can be used for both the cheeks and lips, producing a new type of texture. Two colors are available just for the holiday season. Each color goes naturally with your skin complexion, seemingly absorbed within the expression on your face. The natural and elegant color development and radiance compliment a sense of happiness and vitality that effortlessly wells up from within. X01 Joy U Bring: available in limited quantities and the color used by the model. The heavenly pink enhances the clarity of the skin and produces a pure smile. X02 My Soul: available with limited quantity. The mature rose adds a sensual touch to the lips and gives rise to confidence and grace. It is aailable in limited quantities, in three colours. It transfers the warmness of the heart full of pleasure to the lips. Three special colors for the holiday season embellish the lips with a fresh and rich texture that is like jam. A single stroke produces plump and sensual lips, effortlessly creating a modish color on the lips. The sheen gives rise to a gorgeous and passionate look. THREE Shimmering Lip Jam contains botanical oils that is moisturizing. X05 Lil’ Star: available in limited quantities. Milky star pink with blue pearl that realizes a refined expression. X06 Liberate the Heartbeat: available in limited quantities and color used by the model. A chic wild rose that portrays the glamor of holiday-season nights. X07 Unfiltered Heart: it is available with limited quantity. Dazzling raspberry rose gives a vague and neutral touch of femininity. It is available in limited quantities, in four colours. Holiday dresses for the fingertips. Limited set of four colors transform fingertips into modish and passionate displays in a season full of glistening light. Each color is filled with delicate pearls that release a beautiful brilliance. Neutral colors are mixed with a gorgeous touch, while vivid colors are combined with a sense of sophistication to create a special nuance. X05 Surreal Twist: available in limited quantities and color used by the model. Antique beige with copper pearl that creates elegant sheen. X06 Cloudbursting: available in limited quantities. Neutral taupe with silver and red pearl powder for a modest touch of femininity. X07 Mad Love: available in limited quantities and color used by the model. Twilight lilac with blue pearl for the cool expression of light and shadow. X08 Wild Star: available in limited quantities. Venetian red inspires passion with copper and bronze pearl. 1. Does not use parabens. 2. Does not conduct animal testing. 3. Uses certified organic ingredients as much as possible.